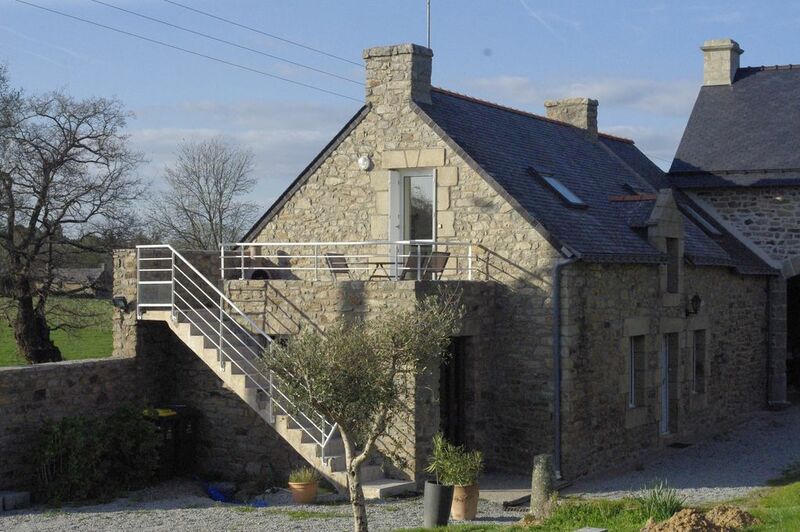 Quietly located in the municipality of Arradon and near the Gulf of Morbihan, this property is part of a farmhouse surrounded by a large garden of about 1000 m2, with a beautiful view. Its access is via an outside staircase. We arrive on a private terrace at the shelter looks. Many activities nearby: water sports, tennis, golf, walking or cycling from the house. Many games left at the disposal of tenants (bikes, board games, children's games for all ages, ...). Nous avons apprécié le calme, le gite très bien et propre, dommage l'absence des bicyclettes !!! Die Ferienwohnung liegt 1,5 Km vom Zentrum Arradon und vom Super-U sowie 5 Km vom Zentrum Vannes entfernt mitten auf dem Lande. Bei gutem Wetter hatten wir mit der Balkonterrasse das große Los gezogen. Dort haben wir die Aussicht genossen, gefrühstückt, gegrillt, gechillt. Als Ausgangspunkt für (Geocaching-)Ausflüge besonders mit unseren Rädern war die Fewo perfekt. Für zwei Personen oder eine Familie mit bis zu zwei Kindern ist die Wohnung ausgelegt. W-lan funktioniert. Eine Waschmaschine steht in einem Extraraum zur Verfügung. Der winzige Geschirrspüler entstammt allerdings einer Puppenstube. Die Vermieterin ist von Herzen freundlich. Sie arbeitet in einer sehr guten Ciderie und vermittelt einen ordentlichen Rabatt. Eine ihrer Töchter spricht deutsch! Es waren noch andere Gäste in der zweiten Wohnung im Haus. Wenn zwei befreundete Familien gemeinsam Urlaub machen, können sie hier wohnen, ohne sich zu sehr "auf die Pelle zu rücken". Nähe und Distanz: Beides ist hier möglich. Endroit idéal mariant la campagne et la mer tout près avec de belles balades à pieds ou en vélo ( gracieusement prêtés ). le gîte est très bien aménagé, petit - bien assez grand pour 3 ou 4 - mais cosy, avec l'agréable impression que les propriétaires l'ont arrangé comme si c'était pour eux. La famille Le Neve est charmante, disponible, attentive. Bref si nous devons retourner dans le Morbihan, ce sera chez eux sans nul doute et nous recommandons fortement ce gîte. Near VALVES: 5 Km. Sea: 2 Km Bourg and shops: 1 KM The house is located in a place called LE CLOS RATZ outside the town of Arradon, quiet but not isolated. The town of Arradon is 10 minutes by bike and houses the necessary shops (bakery, butcher, newsagent, hairdresser, supermarket, restaurant ...). Market every Tuesday and Friday morning (with freshly caught fish ..). The nearest beaches are Kerbilhouet or penboc'h, located 15 minutes by bike - 20 minutes walk - a quiet road. The tip of Arradon home to the sailing center is 5 minutes by car - 15 minutes by bike (courses offered: sea garden, windsurfing, dinghy, optimist .The nearest golf course is BADEN overlooking. the river Auray. The railway station of Vannes is 5 kilometers. A bus network also provides access from Vannes Arradon.